Thank you! Our firm will be in prompt contact with you very shortly. If you are in a car crash and you’re vehicle is damaged you will want it repaired or replaced. This is always a multi-step process: contacting the insurance company; taking your car to a body shop; getting a quote or estimate; getting it fixed; and signing a release. All of these steps require careful consideration to prevent yourself from being taken advantage of by the insurance company. I have redacted the sensitive information about my client and the insurance company. This example is for educational purposes only. 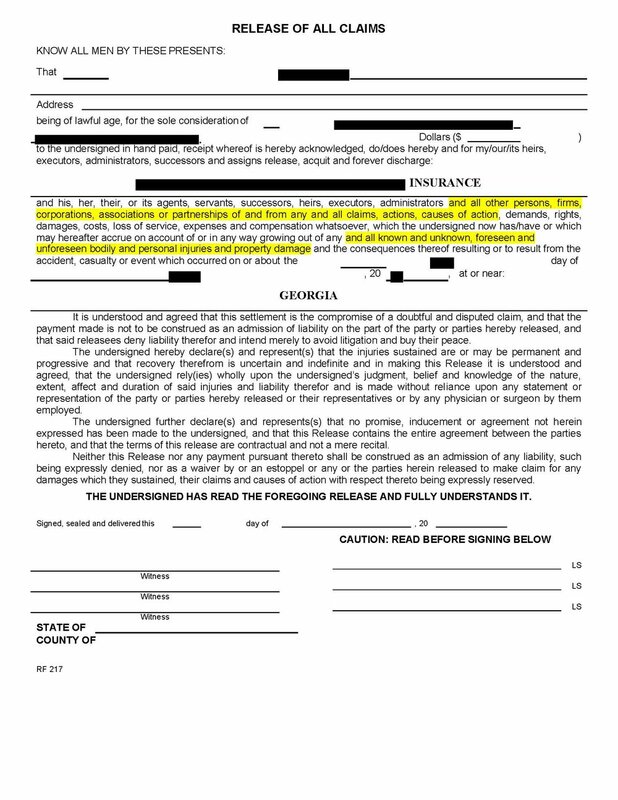 Upon closer inspection of the above release you may notice two things that I have highlighted: 1) The document releases everybody under the sun for the accident - this includes not only the insurance company and the at-fault driver but everyone else imaginable; and 2) the document goes beyond just releasing the property damage claim but extends to personal injury claims and all other claims! If the injured party signed the above release then they would have not been able to bring any other claims such as their personal injury claim against the at-fault driver, the insurance company, or anyone else. The insurance company tried to sneak in additional language to prevent my client from recovering for their injuries and preventing them from seeking compensation from any other party that maybe at-fault. A word to the wise - properly understand what you are signing and what rights you may be signing away. The insurance company is not your friend and does not have your best interests in mind. If you are unsure of the ramifications of what you are signing, then you need to have an experienced accident or personal injury attorney review for you and advise what the release actually does. Never be afraid to contact a personal injury lawyer to discuss a release related to your accident claim. The advice you may receive could increase the value of your claim; stop you from being pressured into signing; and possibly save your entire claim. Personal injury lawyer Wes Pickelsimer offers all of his callers and clients a No Recovery No Fee Guarantee. This means that you will not pay for a consultation fee and the only way our firm receives any money for its legal services is if a recovery is made on your behalf. No matter how big or small your case, we're available to talk to you about the language in your release. If you've been involved in a car crash, truck accident, or motorcycle wreck you must speak with an experienced personal injury attorney as soon as possible. Contact us online or call us directly at 404-610-4429 for your free consultation. Thank you for your inquiry. Our office will contact you promptly within the next 2 hours by phone, text, or email. Pickelsimer, LLC is a boutique law practice located in the Metro Atlanta area. Personal injury and small business work is what I do. I am passionate about my clients, their cases, and pursuing justice. Licensed to practice in the State of Georgia.